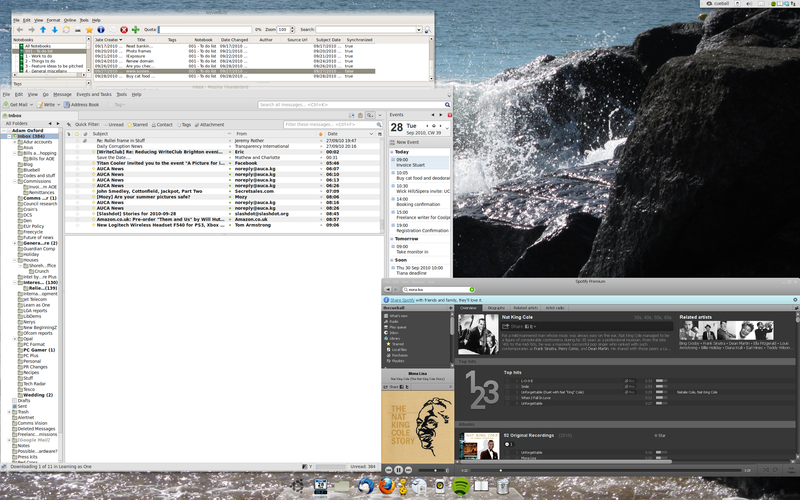 My new desktop - pretty much the same as the old one, without quite as much customisation. I’ve been running Ubuntu on most of my PCs for about three years now, and have been far happier with their performance than I ever was under Windows. The only real problem I’ve had is that as part of my job reviewing and evaluating hardware, I tend to use quite a lot of high end and up to date equipment in my main work machine, and Linux drivers are rarely up to scratch before a new piece of kit is released. It’s understandable that driver teams put their effort into Windows and Mac compatibility, and by definition, the Linux community hasn’t had a new piece of hardware to write drivers for it. Three things have changed enormously since I started using Ubuntu. First of all, it’s a hell of a lot slicker than it was. With each release, there’s less and less need to use the command line and better applications and control panels for simplifying use. It’s also a lot better at detecting hardware and installing the right drivers without any user input at all. Finally, it’s much, much quicker to boot than it ever was – even on my ridiculous work PC with its four randomly sized and aged hard drives that tripped it regularly before. I tend to keep everything on my machines as up-to-date as possible, which isn’t always a good idea with Linux. Unless it’s a security hole you’re fixing, it’s much better – in my opinion – to take an ‘if it ain’t broke’ attitude towards upgrades. I do not have that attitude. When I updated my main PC for what must be its fifth or sixth distribution upgrade – to 10.04 – I noticed a few things were starting to go wrong. Graphical glitching began to appear as windows failed to redraw correctly, the machine would crash three or four times a day (it was always rock stable before) and boot times were way down on what they should be. It took me a while to realise that actually, the problems were beyond repair. The various undocumented hacks I’ve performed on this particular PC since installation to do things like improve boot speed and get PusleAudio working with my Creative X-Fi or install a DirectX-11 class graphics card had been superceded by new drivers and native performance tweaks. Somewhere, several things were conflicting, and the chances of finding them were slim. So I finally gave up and re-installed the latest beta of Ubuntu – due for release next month – from scratch. Because this is my work critical PC, with four years of accounting details and archives of articles, research and photographs, I took my time. The new installation is on a 128GB solid state drive partitioned into two halves, one for the file system and one for my home folder, while the existing hard drives have been left intact with new simlinks to the old documents folders. All I need to do is wait until I’m confident this new installation is good then clear out the system files from the old disc so that it’s dedicated for data. I figure that way, if everything goes wrong again reinstalling a new OS will be much easier. It’s taken me the best part of yesterday afternoon and this afternoon to get it up and running and download most of the apps I use on a daily basis. The only thing left to sort out is installing my photoediting software (Silkypix through Wine, because it’s the only thing other than Bibble – which I can’t afford – that automatically corrects lens distortion for a Panasonic GF1) and finally settling on a video editing workflow. So why the long post about a relatively mundane piece of computer housekeeping? Long story short – I’m very impressed with Ubuntu 10.10 already. It’s stupidly fast, and all the stuff I’ve lost countless hours trying to fix in the past works out of the box. The only things I don’t like are the new themes – but then I’ve never come across a Gnome theme I’ve absolutely fallen in love with yet. I refuse to use an OSX clone because, well, it defeats the object. But in all honesty, nothing really comes close to being that elegant does it? I’m going to put together an ‘open source journalist’s toolkit’ at some point in the near future with of specific apps and workflows that can slash the cost of running your own multimedia editorial studio, but for now, suffice to say I think that Linux has really come of age.I can’t imagine being able to set up and configure a completely clean install of Windows or OSX as quickly.